Yesterday, Motorola finally made their first wood option available for the Moto X through MotoMaker. While we would have loved to see Ebony, Teak, and Rosewood also make the cut, we’re fine with Bamboo for now and even ordered a 32GB model. At the time of purchase, we were told not to expect the device until January 6 or “early January.” We made sure you were aware as well, that “Natural” backs likely require more time for assembly, so should you have opted for Bamboo, it wouldn’t arrive in time for X-mas. 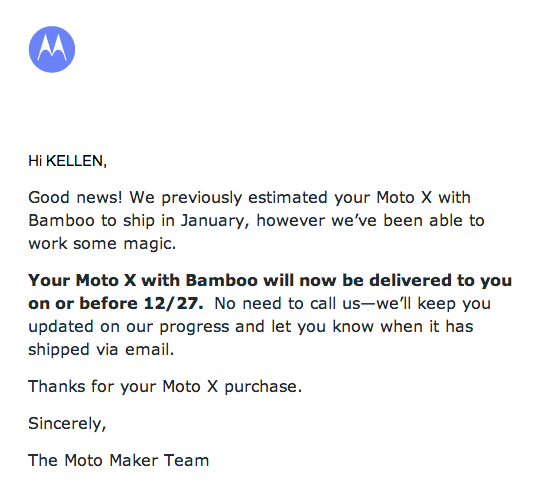 In what can only be perceived as good news, we just received an update on our order saying that Motorola was able to “work some magic” and plans to have ours delivered on or before 12/27. So there is a chance! For us, we really just care that it arrives before the original date, which would have meant we were in Vegas for CES and not able to receive the package. But for the rest of you, assuming the magic is happening for more than just our order, you may have a wonderful X-mas surprise after all. If you ordered one, is yours shipping early as well?